Congratulations to NOVA and tip of the hat to Norfolk, Plate Champions, and United,Bowl Champs. The 25th Annual Monk Vaughan 7s Tournament! Monk Vaughan is this Saturday at Mountain Rd. Playing or not, come on out to help make this historic 7s tournament a success and to root the boys on. The Tournament party will be held at The Dugout right down the road after the tournament. Play commences at about 10:00 Saturday morning and we can use any help available to assist with field preparations. Here again, contact Phil at philstrunk@comcast.net to sign up or go to the online Player Forum Message Board. Gents: It is with great pleasure that we extend an invitation to your club to participate in the 25th Annual Monk Vaughan 7s Tournament in Richmond, Virginia on Saturday, May 28, 2005! Please see the below particulars on how to enter. This year's tournament marks a mile-stone for us as one of the oldest 7s tournaments in the United States, and we would be delighted to have you travel to Historic Richmond to participate. As always, the tournament will be followed by the Awards Ceremony and our famous "Stuntman" Third Half in Historic Shockoe Bottom. Monk is kneeling in the front on the right,beard, looking to the left. 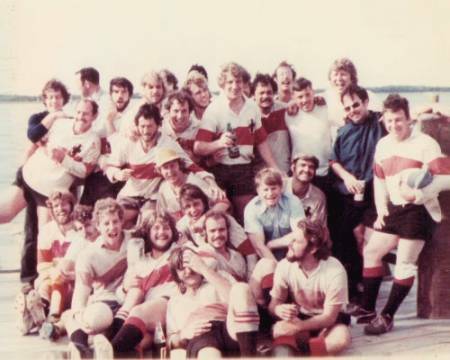 This tourney honors the memory of our rugby mate Monk Vaughan , a superb scrumhalf for old Richmond RFC, a warrior, outstanding business man, and friend to the bikers, judges, and politicians of our fair city. Monk was respected by all for his playing ability and was loved by all for his spirit and thirst for living. He was cut down by a drunk driver in his playing prime. This tournament serves to remind us all how lucky we are and to act responsibly when drinking is involved.